Boutique Craftsman: Hip-Weinlese-Chic-Stil, zu einem unvergesslichen Erlebnis! Wenn Sie für einen sehr kühlen, einzigartigen und unvergesslichen Ort zum Verweilen suchen, haben Sie es hier gefunden. Die Rose ist ein 1920 Handwerker, von der Gründung vor 8 Jahren komplett umgebaut. Mit einer offenen Raumkonzept Küche und Wohnzimmer, zusammen mit 3 Schlafzimmern, die Rose können 6 unterzubringen. Entspannen Sie sich vor dem Fluss Kamin, Bad in der Wanne im schönen Ambiente unseres gestylten Bad (mit Roben), oder genießen Sie die Schönheit der Hand gepflückt, grob behauenen scraped Etagen. Morgens genießen Sie ein wunderbares Wohnraum im Freien mit atemberaubendem Blick auf den roten Felsen, oder relaxen Sie später in den warmen Sommerabenden mit einem Grill. Sprechen Sie einen Spaziergang zur Hauptstraße der Stadt, die eine kurze zwei Blocks entfernt für einen schnellen Kaffee oder schönes Abendessen ist. Die Betten in der Rose sind überlegene Qualität für höchsten Komfort und sind reich verziert mit luxuriöser Bettwäsche bedeckt. Die schäbige schicke Interieur und gegossen Zementböden summieren sich zu einer entspannten Atmosphäre und charmante Boutique-Erlebnis. Sie werden nicht vergessen! Wir besitzen auch die Tex Cottage und wurden in der Ferienwohnung Geschäft seit 2002. Solid home base for exploring Escalante / Zion / Bryce -- but a quirky house. This was a good home base to explore Escalante slot canyons, Zion and Bryce (though Bryce is a full 90 minutes away). We were traveling with a dog and the canine part of our group was very happy. The owners are definitely going for shabby chic and have totally committed to that. The beds were very comfortable and the shower / bath was strong and hot. Much appreciated after days hiking in the canyons. Other parts of the house itself are quirky. Some of the elements are less than optimal. The dining table is basically unusable as it is wobbly tin. The kitchen is split into two parts separated by some distance and little counter space. Cooking is awkward. On balance, this was a win. What a fun & welcoming cottage! Comfortable beds, lots of outdoor space to enjoy the days and and nights (watches a meteor shower from the front porch one night!). Enjoyed the dip in the pool at the Kanab Boutique hotel as well. Great kitchen & grill to enjoy a dinner at home and perfectly located to explore all of the areas natural wonders. Thank you for taking the time to review and we are happy to hear you and your family enjoyed staying at The Rose Cottage. We hope to have you with us again one day! Conveniently located for access to Zion, Bryce and North Rim. 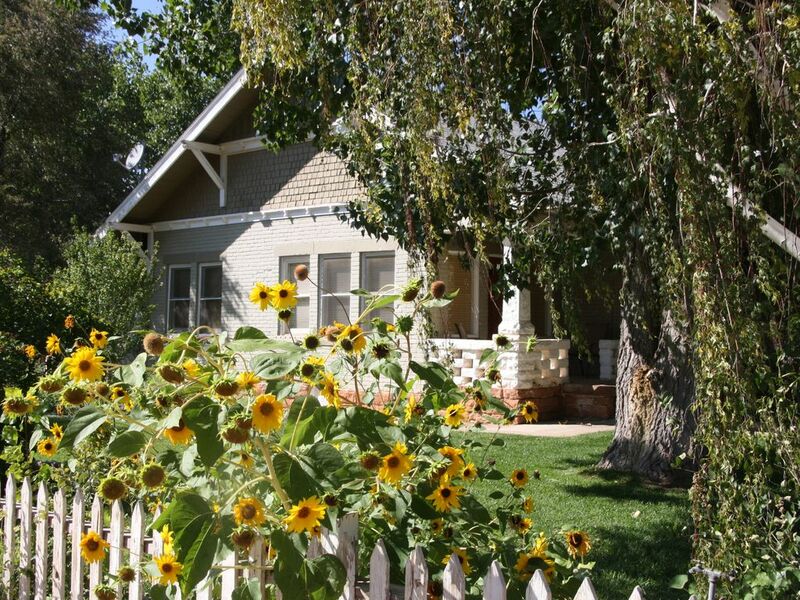 Nice, comfortable cottage in walking/biking distance to downtown Kanab. Provided a great base to explore the region. Kitchen could use an update--no counter workspace. Bedrooms were comfortable but need mirrors. In general, it is a little cozy home away from home and good location. However, the house need some maintenance. The blinds in bed rooms did not come down fully. The stove required matches to lit. The basement/laundry room was a bit messy. It will be a good stay if you do not mind those little things. We loved our little bungalow in Kanab. Charming and well located for Zion and Bryce Nat'l Park. Nicely decorated. We wish the window screens had been better maintained. We enjoy cool nights in clean air, but were not able to leave the windows open. A very minor distraction for a lovely home. The entire family loved this beautiful bungalow. Such a lovely to stay. We will definitely return.